My dear friend and talented designer Daz Smith has come up with this great cover, based on a key scene in the book. Paulette Mahurin author of “The Persecution of Mildred Dunlap” and “His name was Ben“, released this week. “Conditions” will be a strange and special occurence for me. I am going back to the very first book I’ve ever written. Five years ago I was working on a training manual when I decided to experiment with writing fiction. The planned short story grew quickly and when it reached 36 pages and showed no sign of ending I abandoned the course and continued writing. I put it aside and wrote my other novels. 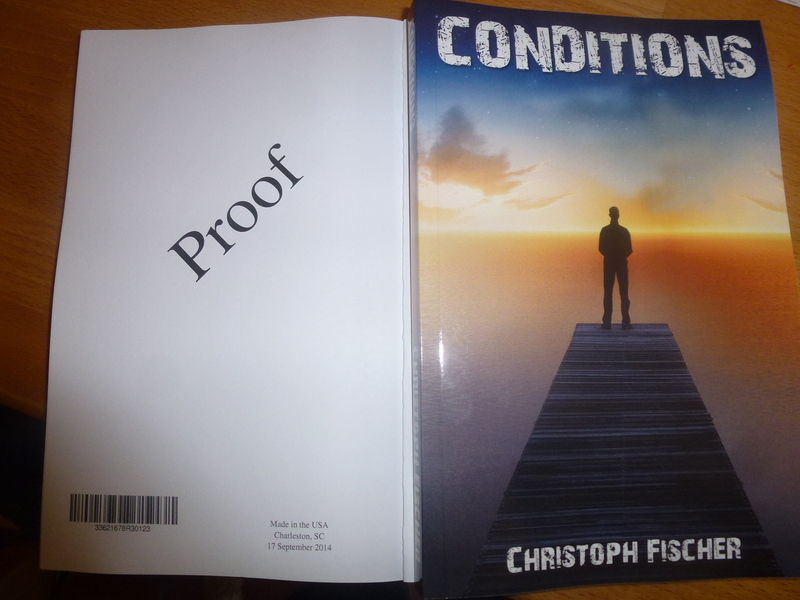 “Conditions” had a lot of the typical errors that a first book can have and I never was sure if I would ever be able to publish it. Ever so often I returned to it and made changes and improvements. The book underwent plenty of re-writes and edits but now I feel it might resonate well with some of those readers who liked “Time To Let Go”. I used to go to a lot of funerals when I was in my teens and might have developed a morbid fascination at the dynamics and processes involved. I also loved “Six Feet Under”, a TV series set in a funeral home. I grew up as a bibliophile in a very macho and sports orientated environment and always bonded more with the odd characters and outsiders rather than the prom queens and sports heroes. Over the years I have met and befriended many other “misfits”. In this respect the novel is probably the most personal book to me. The events and characters are all a figment of my imagination. Re-telling something that has happened already has never had an appeal to me as a writer. I imagine Tony somewhat hardened boxer type with a light gentle touch and Charles like Alan Cummings, Johnny Depp or even Benedict Cumberbatch in some of their more eccentric roles. The story has been likened to The Breakfast Club – I don’t know if that’s true as I have not seen that one yet. I am toying with a sequel for this book already since it all takes place only in the space of two weeks. I hope to have the book ready for publication in October 2014. Echoing Paulette’s comment, Bravo, Christoph! This book sounds fascinating! What can I do to help promote it? Aw thank you Lorna. I know you are mega busy with your own book so I wouldn’t suggest anything too time consuming. Maybe if you had a spot on your blog some time I could send you the blurb and the cover picture?